LOS ANGELES: Warner Bros. Consumer Products and ASA Entertainment ramped up PR for their second annual all-female action sports competition and music festival, Supergirl Jam. The event takes place in Huntington, CA, July 25-27. The effort's target audience is 13- to 19-year-old girls. 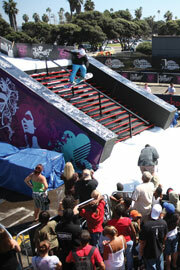 The campaign is promoting the competitions and athletes, which include snowboarders, skateboarders, and surfers. It is also reaching out through online efforts and text messages. "Last year, we set out to reposition the Supergirl S-Shield in the marketplace as the universal icon for girl empowerment," said Barry Ziehl, SVP of worldwide PR and marketing for Warner Bros. Consumer Products. "This year, we made the Supergirl Jam all about the girls, a three-day event, all-female action sports. We increased the presence for the Supergirl program in the action sports world." For example, when the PR effort began in May, committee athletes, such as snowboarder Gretchen Bleiler and inline skater Fabiola da Silva, participated in media interviews. They will also take part in a charity event with the Orange County nonprofit Girls Inc.
ASA Entertainment, an organization that connects brands to consumers through action sports events, used online outreach, including MySpace, blogs, videos, and Web sites targeting local high school students to connect with teenage women, according to Denise Abbot, director of media relations at ASA. Leading up to the event, ASA and Warner Bros. plan to increase mobile and text-message marketing. "Because of the nature of action sports," Abbott said, "it's almost as if [fans and athletes] live to text." Warner Bros. Consumer Products worked with SnL Communications, which specializes in both fashion and action sports industries, for background counsel as it positioned itself in the action sports community. ASA handles PR in-house.